Recommended to: Parents looking for a book with a big message about being yourself. Difficulty Level: I'd say higher level readers, since some of the words are a bit tricky. This is also the perfect read aloud book! 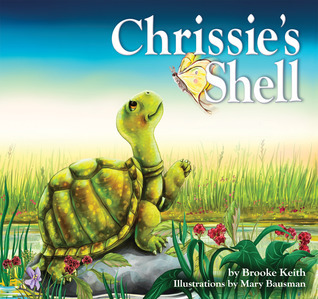 Wonderfully written and beautifully illustrated, Chrissie's Shell is the story of a little turtle who desperately wants to be someone else. To Chrissie, her shell is empty. She doesn't see herself as a "someone", and dreams daily about being another animal. Someone faster, stronger, or even just prettier. Through the story, Chrissie learns that being her is actually quite special, and that she was made that way intentionally. Honestly I really loved this book. Although I'm no longer much of a church goer, the overall message in this book is one that I think can be shared with all, no matter what your religious affiliation. Chrissie's story shows children that they are who they are on purpose. That each person is different, and special! As Chrissie morns her empty shell, she actually keeps doing good deeds for others with what she is given. It's really quite touching. I see this as a great story to share with a Sunday school class, or something read to a child before bed. The illustrations are bright, vivid and honestly quite adorable! I'm an adult and I still giggled when I saw the mouse with wheels for feet, as Chrissie compares him to a race car. There is a lot to love in this book, no matter what age you might be.